This inspired collection features beautiful songs by composers and poets buried at Mount Auburn including Chadwick, Paine, Foote, Pinkham, Thompson, Daniels, Lang and Howe. Jean Danton and Thomas Stumpf have performed the poetry and songs of those now buried at Mount Auburn Cemetery and are bringing the long-forgotten words and music back to life. This recording is a testament to the power and endurance of the words and notes written decades (and centuries) ago. 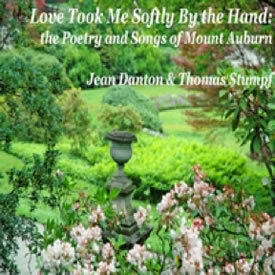 To download this digital-only album, please click on the album cover or this title link Love Took Me Softly By the Hand: the Poetry and Songs of Mount Auburn to go to CDBaby. These 12 songs can be purchased as a digital album or as singles.